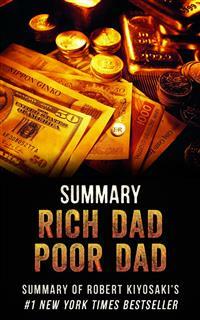 Summary of "Rich Dad, Poor Dad" - Learn more. Read Less!. The book has sold over 26 million copies and has appeared on the best-seller lists in The Wall Street Journal, USA Today, Businessweek and The New York Times. The book has been translated into 51 languages and won an Audie award in 2001. Apparently, everybody wants to be a rich dad. This material further expounds on ideas, mindsets and ideologies which Robert Kiyosaki was communicating in his book. Ensure to read to the end and as well apply what is learnt as not all knowledge is power but applied knowledge is actual power. Never stick to a single perspective of life. What’s spurs a single life’s perspective? The indulgence in this occurs when as an individual, you fail to recognize the fact that amongst the reasons why all men are not born at the same time is so that there can be a transference of knowledge and experiences from generation to generation. The isolation of one’s self, thinking all your experiences can get you need to the insatiable desire ingrained in man is a mistake which would only get you killed even before you started. The thoughts and reality to which we accept as the way life ought to go is largely dependent on the aspect of life we can see and have partaken of. Never would a man think it possible to singlehandedly own an organization if he has grown to believe only governments have the financial ability to do so. The need to have various perspectives to life gives you various experiences as it’s utterly impossible for a man to have various simultaneous experiences but he can feed on the experiences of those who have had a foretaste of what he dreams to have and where hopes to be. Be open to the ideas, perspectives and experiences others may have for you. Your openness to them doesn’t mean you have to do or walk by all they say. It shows your willingness to learn from them, become better at what they succeeded at and also surpassing same and also run away from errors that they have made which has become a total disadvantage to them. You can never determine what you would gain from the well of experience, idea and perspective others have to offer you. An unwanted perspective of life could yet be a lifesaving perspective. The mind of a man is much more powerful than it is generically viewed to be. The ability of the mind has hitherto been undermined. The mind is fed majorly by the kind of things you listen to and experiences that are prominent to you by folks in your circle. John Locke said,“The mind is a tabula rasa”.This is very true and what we feed it would determine what we claim to be the truth in various situations and how we handle them. Folks many a times do not consciously feed their minds with information and experiences that constitutes a constructive construction of their thought patterns. Instead their minds are left to grow radically in negative construction. See your mind as a lawn, what happens when your lawn isn’t gardened and cultivated? It either grows in to a bushy lawn or a brown lawn but the opposite of this happens when proper care of the lawn. So goes your thought pattern about life and various activities when you cultivate it intentionally. Choose to be deliberate as to what you allow into your mind. The process of learning is not a one way street, there are opportunities for you to learn, unlearn and relearn depending on what you need to apply to yourself per time. Robert Kiyosaki had the opportunity to choose between different opinions early know and to stick with it. What he did in that stead was to listen to both sides and pick what he believed would shape his life in the right direction from both perspectives which were at his disposal. He chose to be deliberate and it turned to be of great profiting to him. You should adopt the deliberativeness of building the right thought patterns. Entitlement mentality is not always pronounced. It could be subtle at times. It has become a norm of the society that it has been passed on from generation to generation. It’s that mentality that spurs individuals to think all the investments they have made in their lives to gain an education is supposed to be dumped at an office desk with the promise of a pension after working with them for several years with the benefit of health insurance and everything else the organization promises to offer you by your service to them. It’s subtle because this is expected from every employer after their staff has shown their loyalty to them. Having the entitlement mentality behind your life’s core philosophy is commencement of the bane which you would experience as you would discover that you’re unsatisfied with the kind of life this mentality would bring you. The earlier this is figured out the better it is and the faster you can make adjustment to position your life aright. Unthreaded paths are equally known as dreaded paths even though they lead to you where you want to go. Individuals find it difficult to change especially when it involves going in a direction they’re not familiar with or don’t have tangible information. Robert’s rich dad was one who emphasized the threading of unfamiliar threaded path. The world’s wealth is controlled by 5 % of its entire population. This controlling sect have been able to be a part of the oligarchy in the society because they chose to take unfamiliar paths which the larger populace isn’t willing to take. They dared the dreaded and were able to secure for themselves a position in the controlling populace. His rich dad wanted to make sure Robert didn’t see the world the way every other person saw it. If he saw the world the way every other person saw it, he was going to inevitably end up the way every other person ended up. Folks don’t take the unthreaded path because it doesn’t provide for them the certainty of outcomes and security which they would get if they take the path which is known to others. Seeing the invisible (unthreaded path) causes you to do the impossible. Just as Robert was not dismayed in any way by the uncertainty which he was likely going to face in taking that path which isn’t known to many. In order to escape the fuss which everyone is going through, you must be ready to take that step, take that turn which you are not certain of, letting go of the fear of the unknown which majority are engulfed in as man seeks to always be in control of the variables in his environment. When he cannot, insecurities kick in. Regardless of those insecurities which are likely to kick in, a positive mind and a driven focus of where you want to be supersedes the fear of the unknown which you are likely to come about on the way.